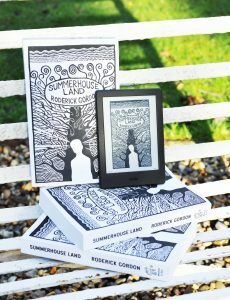 Summerhouse Land is a new book by Roderick Gordon, author of the Tunnels series. It was initially published in late 2016 in a limited edition of five hundred hardbacks. With a striking cover illustration by Stanley Donwood, these copies were all individually numbered and signed by the author. You can order them on this website. Alternatively, Summerhouse Land is now available in a US-English version in either paperback or eBook formats on Amazon.com, or as a UK-English eBook on Amazon.co.uk. Please follow the links. The hardbacks are still available (just), but if you need to know anything before ordering, don’t hesitate to email us on info@summerhouseland.com. We can only accept payment by PayPal (you don’t need to have an account in order to use a credit card), and all orders will be dispatched by the First Class recorded service for addresses in the UK, or by the Royal Mail international service to other countries. Postage costs are calculated at checkout, but as a guide, p&p for a single book to a UK address is £5. All overseas orders will be sent using a tracked postal service.